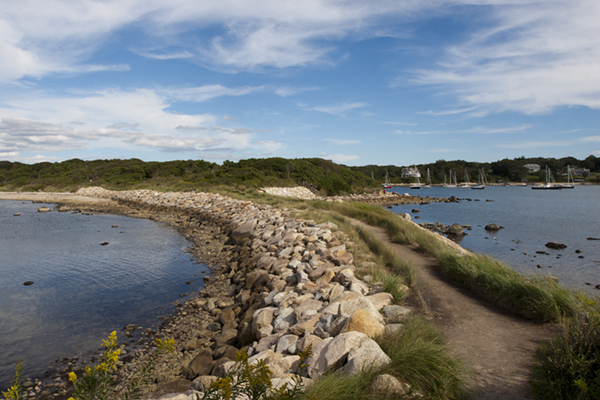 Taken from the pages of the 2018 CapeMade Field Guide, explore some of our favorite spots in Falmouth and Woods Hole with us! Start your day with pickled veggies + housemade Bloody Marys at the Pickle Jar Kitchen in downtown Falmouth before perusing the adorable shops on Main Street or the impressive Farmers’ Market (every Thursday 12pm-6pm) at Marina Park. Take the stunning beach route by taking a left onto Central Ave off Rt. 28 and stay straight until you see the water. Turn right and follow that road all the way to the Falmouth Heights stopping at the beaches along the way for incredible views of the ocean and Martha’s Vineyard. Pause along the way at Nobska Lighthouse or take our favorite walk out to The Knob at Quisset Harbor. Continue along the coast into Woods Hole and ditch the car before hitting up Pie in the Sky or Coffee Obsession for a mid-day boost. Tour the Ocean Science Exhibit Center at WHOI before grabbing beer and tacos on the patio at Quicks Hole Taqueria or craft cocktails and local eats at Water Street Kitchen. Turn drinks into dinner in Woods Hole or make you way back to downtown Falmouth for dinner at C Salt, Anejo or Osteria La Civetta to name a few!